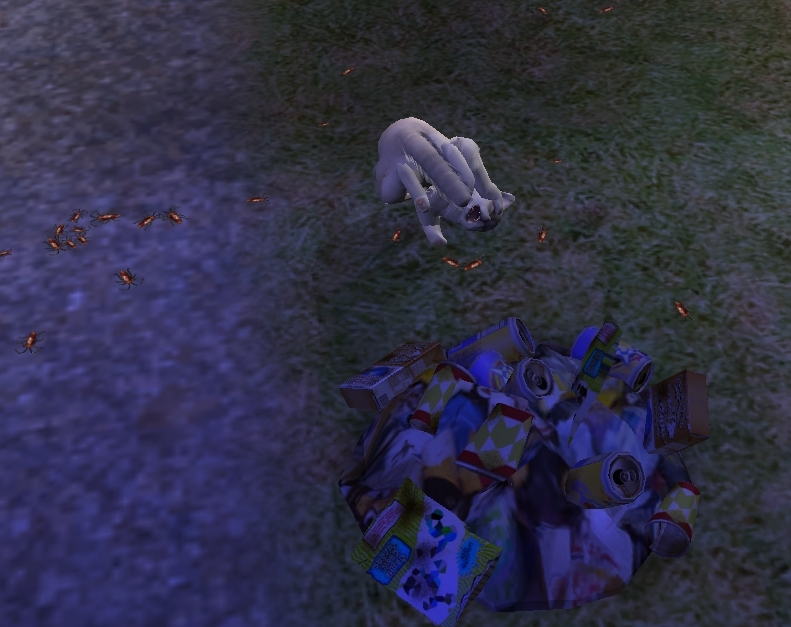 I loved the hunt interaction for cats in Sims 1 and I was disappointed that they didn't get something similar in Sims 2 (too few pet interactions overall, but anyway ...). While expressing this dissatisfaction on the 'Hacks I'd like to see' thread, shortly after posting Phaenoh posted offering to help anyone who wanted to try and make any of the mods reality. Well, that was just demanding that I take the opportunity! 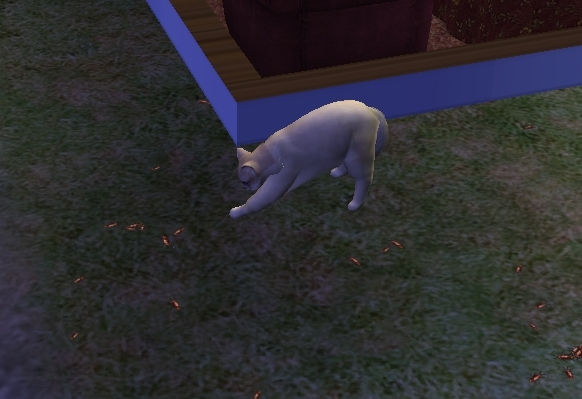 This mod will allow your cats to hunt those pesky roaches that hang around causing disease and frustration amongst your sims. 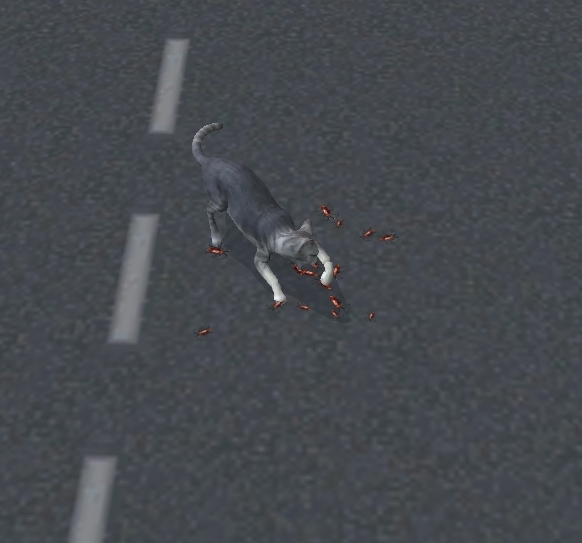 The action is autonomous and appeals to the cat's fun motive. It raises fun and lowers hygiene (for playing with filthy roaches). Thanks to my RL dog and her revolting habits there is also an option for non finicky dogs and cats to eat the dead roaches. It raises hunger and lowers hygiene and removes the dead roaches so your sims don't have to clean them up. 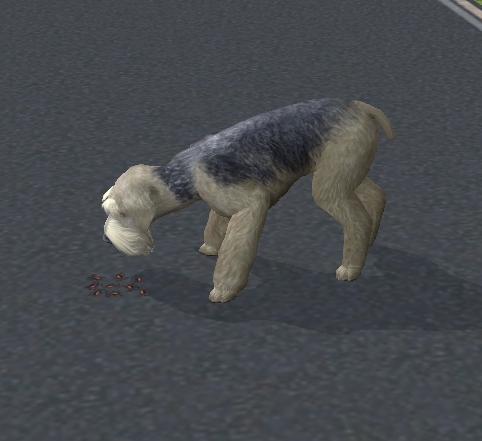 I copied the animations from the pet food bowl, but decided that it was a little too disgusting to allow toddlers to chow down as well (even though I'm sure that there are RL toddlers who would totally eat bugs). 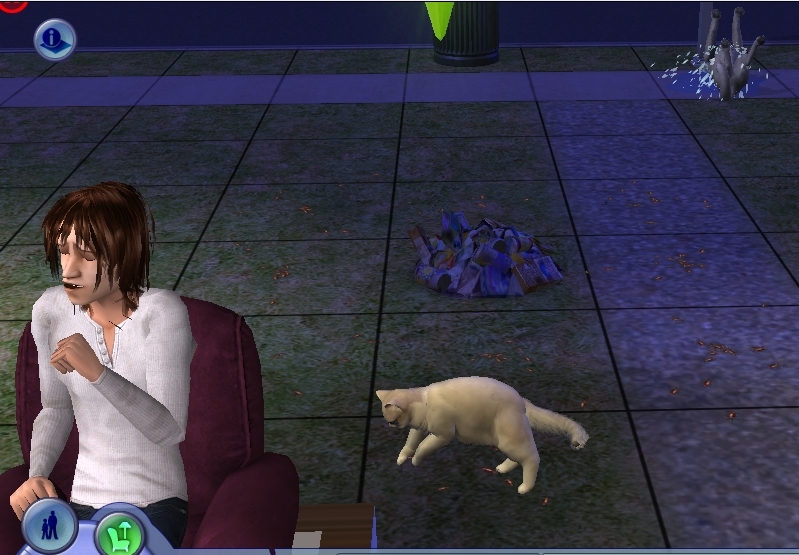 This mod overrides the 'Roaches' object, but shouldn't interfere with any of the human sims' interactions with the roaches. It may conflict with any other mod that also affects the 'Roaches' object. I just discovered that Sunni has made a buyable rat object at Plumbbob Keep that functions in the same way as the roaches and she has a Pets version that she added the cat interactions to! I know there were some people in the comments craving rats instead of roaches, so you can run over and grab it here. Number of roach spawns I managed to get on one lot after it had been trashed for testing for quite some time: 15 (although I may not have counted some. I swear the maid cleaned up more than 15 after I called the exterminators). Apologies to: My sims, who spent many miserable hours locked in the house or having their desperate spray actions cancelled so they didn't kill off my hard earned roaches. Much crying, flu and environmental frustration was experienced. 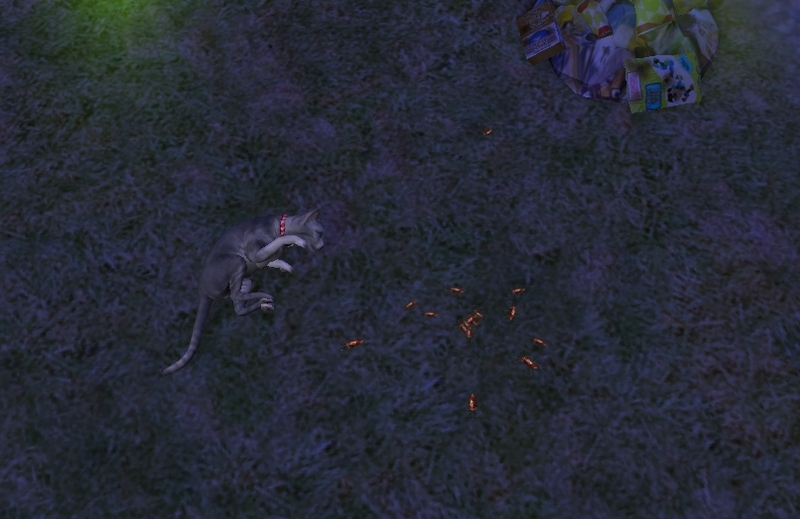 Also to my pets, who, due to me randomly adopting to get more pet variety for testing, ended up spending all their non testing time either fighting or running away (I had three highly aggressive pets and one cowardly. At one point they had all run away). In memory of: Denny and Kirby, my two elder testers, who died shortly after I finished the testing (I'm sorry, Kirby, for taking such bad care of you that you died while run away). Thanks to: Phaenoh, who held my hand throughout the entire thing and gave me tons of advice/tutorials/testing/fixing screw ups/answering stupid questions! I could not have even started it without her and she stuck with me all the way through what ended up taking probably far longer than it should have due to my ineptitude! I cannot thank her enough! And thanks to Balin (pictured above, rolling in pee), the wolf who kept hanging around annoying me by barking at the door, but was forgiven when he autonomously proved that visitors to the lot could eat roaches too. Assorted people: maybesomethingdunno, Echo, Mootilda, Nysha, HugeLunatic and mustluvcatz, who helped me on the boards when both Phaenoh and I were out of ideas.